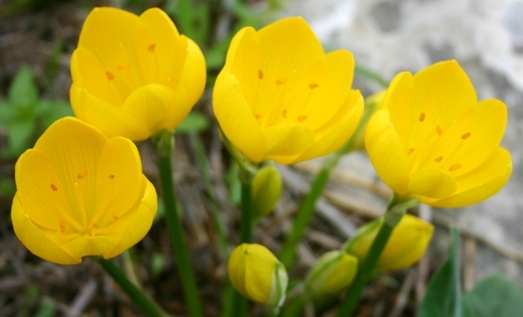 One of the first autumn wildflowers in Italy is the sternbergia lutea with its bright yellow flower that has a crocus-like shape. In fact, it is often erroneously referred to as Autumn Crocus. It is actually more close related to the narcissus (daffodil) in the amaryllidaceae family. The easiest way to spot the difference is by noting the number of stamens in the flower- a crocus has just three, while the sternbergia lutea has six. 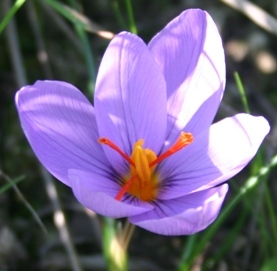 Soon after the the sternbergia is finished blooming, the lovely purple saffron crocus appears. If you are a patient person with a hankering for risotto alla milanese, you can gather the tiny amounts of saffron from the flower’s stigma. Autumn in Italy is also the time for beautiful walks, when the summer haze lifts to reveal splendid clear skies and far-reaching views. In my backyard in Sicily, the peak of the Mt. Etna volcano appears, while in the Chianti area of Tuscany the craggy Appenine mountain range suddenly comes into view. And a walk is always a good excuse to taste. Crisp autumns days in Tuscany invite the walker to explore pathways through golden vineyards, stopping in one of the delightful hilltowns in Chianti for a taste of the vino novello, the season’s new wine. In Sicily, its still warm enough by the sea to have a picnic, and I love to go to the Vendicari coastal oasis, and follow the ancient Greek road to a rocky overlook. This is a good place to sit in the sun, watch the changing colors of the sea, and slurp up the juice of the season’s first oranges.